Location, breakfast, room on the 6th floor, staff. The hotel is to high standards! Everything is just perfect: the stuff, the food, rooms, location! Highly recommended! Just book it and enjoy !! Beautiful view from the room and the breackfast aread. The breakfast was great with big variety in the buffet. My room, the garden and provided sun beds all over looking the sea. I liked the breakfast after I got over the feeling of being on an overcrowded cruise ship. Mornings were wonderful to have breakfast on the veranda overlooking Mouse Island and the Ionian Sea. Breakfast staff was excellent, food very good and I liked the table of coffee, juice and croissants as you walked in. The way that receptionist treated me and my sister during our entirely journey, and the diversity of the buffet everyday from the breakfast to the dinner. Corfu Holiday Palace This rating is a reflection of how the property compares to the industry standard when it comes to price, facilities and services available. It's based on a self-evaluation by the property. Use this rating to help choose your stay! One of our top picks in Corfu.Overlooking the sea, a lagoon and the famous Pontikonissi, this holiday resort is close to Corfu's town center. It offers private access by cableway to the sandy beach, and indoor and outdoor pools. Free WiFi is available in the property's lobby. When would you like to stay at Corfu Holiday Palace? Includes a twin bedroom and furnished, spacious balcony. Offers views of the Lagoon Halikiopoulou, distant hills and Corfu Town. A third person can be accommodated in an extra bed. This room includes a twin bedroom and furnished, spacious balcony. 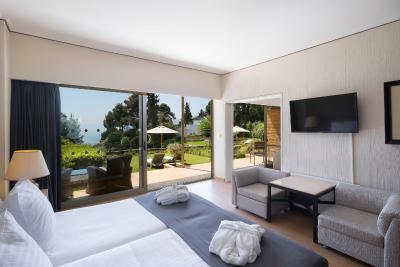 It offers views of the Ionian Sea, the pool and gardens. A 3rd person can be accommodated in an extra bed. Opening out to a balcony, this suite consists of a separate bedroom, a living room and bathroom with bathtub. It can accommodate 2 more guests with an extra charge (see Hotel Policies). These elegant suites sharing a pool can accommodate up to 2 adults and 2 children, or up to 3 adults and 1 child. Features direct access to the main seawater pool bar and pool restaurant-bar, as well as the elevator to the private sandy beach and the beach bar, as well as the indoor heated pool and the health club. There are lounge chairs and umbrellas in the lawn for all neighboring rooms, where guests can enjoy the sun, with a more private and secluded swimming and sunbathing experience. This spacious suite has 2 separate bedrooms, a living room and private balconies overlooking the Ionian Sea. Located next to the main building, amid blossomed gardens, this country-style bungalow offers views over the Pontikonisi, the Ionian Sea and the Monastery. It opens to a balcony or terrace. It can accommodate 2 adults. Located on the top floors, this room offers lake views and includes air conditioning, a bathroom with a bath, satellite channels and fridge. Please note that a 3rd person can be accommodated in an extra bed. Located on the top floors, this room offers views of the sea, pool and garden, and includes air conditioning, satellite channels and fridge. This suite may accommodate 4 adults or 2 adults and 2 children. Boasting a private pool, this elegantly decorated bungalow features a TV with satellite channels and coffee making facilities. The bathroom is fitted with a bath or shower and offers free toiletries. It can accommodate either 5 adults or 2 adults and 3 children. Set in landscaped gardens, this bungalow offers 2 bedrooms and a spacious, stone-paved and furnished terrace with direct view of the sea, Pontikonisi and the Monastery of Vlacherna. A flat-screen TV with satellite channels is included. This split-level bungalow has a bedroom on the upper level and a living room on ground level. 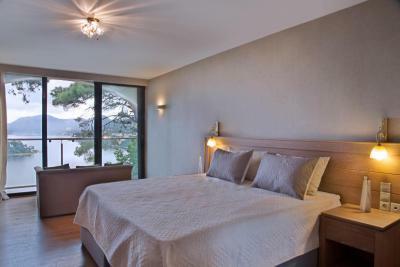 It also features 2 bathrooms and a spacious, furnished terrace overlooking the gardens and Chalikiopoulos Lake. This bungalow has air conditioning, seating area and sofa. House Rules Corfu Holiday Palace takes special requests – add in the next step! Corfu Holiday Palace accepts these cards and reserves the right to temporarily hold an amount prior to arrival. Please note that free WiFi access is available at the property's lobby area. Please note that guests may experience some noise from the airplanes due to the proximity of the hotel to the airport. Needs a bit of an update, clearly an old grand and excellent hotel back in the day but needs a spruce. The airplane departures and arrivals are a bit prevalent if you’re looking for tranquility. Great view over the sea and great grounds if you’re looking for a carefree consolidated place. The staff were super helpful, always. I would suggest sea view room. Eleftheria and Anastasia at the reception were super nice, very professional and helpful! Many thanks again for that!! Great breakfast, Magnificent room view, great value for money! Beautiful location, excellent hotel, big spacious rooms. Great selection for breakfast. Friendly and helpful staff. The hotel is very tired and worn is some areas, we stayed on level - 2 rooms with private shared pool, the whole are smells of damp. The indoor pool is very dark and tatty. None of the official photos are a true likeness of the hotel, its certainly is not 5 star luxury, 3 stars tops. Smell of mold on the bottom floor. Felt humiliated at breakfast, after waiting for an outside table to become free. This was not a problem as we preferred to sit outside so did not mind waiting. We were shown to our table and enjoyed fruit and juice for our first course. We then went to obtain our cooked breakfast and pot of tea. I returned to our table and sat down. I was then advised by a young man that I was sat at his and 2 friends table which he had been given by the restaurant manager. By this time my husband had returned with his food but nowhere to put it or sit!! The manager arrived and was not very helpful ! Eventually the young men were given another table but we did not receive any apology whatsoever! I felt most upset at this unfortunate start to our holiday in Corfu! The hotel needs urgent renovation. Beautiful scenery and grounds of the hotel. Great views! The wifi was spotty in the room and the jet tub was not working. We extended our stay and they gave us their only room available so these two things are not too vital.